Whether by choice or necessity, a lot of people are downsizing these days. Having a smaller space presents decorating and design challenges for both everyday living and the holidays—yes, even in Brookfield, Illinois. Downsizing to a small space allows you to decorate with subtlety and a selective eye. Let’s dispense with the misconceptions around living in a smaller space. Okay, depending on where you’ve purchased your new home, you may feel a certain obligation to decorate your home for the holidays in a way that will “keep up with the Joneses”, but I’m happy to tell you that your new, cozier home doesn’t need to “go big”. You’re downsizing for a reason, right? Fight the urge to decorate like you used to when choosing your daily dressings for your new walls—consider yourself more of a connoisseur—your “small space” can be big on taste. Become a gourmet decorator. Give your eyes breathing space. Avoid the misconception that “more is more”. The number one misconception? That using white will make your space look larger. Not so, say experts. Another mistaken belief is that less and smaller furniture is the only option open to small space owners. But decorating limited space is more about placement of furnishings and careful color usage. Consider your new home in Brookfield the start of building your space around yourself. As you begin, whether during the holidays or not, consider that there are some best practices for getting started decorating your small space. Let’s start with color. It may seem counter-intuitive, but sharp, bright colors work best in smaller spaces, with plenty of negative space between. “Negative space” is a common design term that simply indicates a resting space for the eye. Translation = don’t buy into the need to cover every inch. Consider using splashes of color in unexpected places like the insides of bookcases, windowsills and radiators. Some designers suggest starting by simply picking one wall in every room as your focal or accent wall. Consider decorating that focal point wall, and using it as a muse for the rest of your room. When it comes to the kitchen, you can afford to go very bold. One hot trend you’ve no doubt noticed is the deep red kitchen. Another room people tend to go neutral is the bathroom, but this is another place you can have fun with color. 1. Use mirrors to reflect light and create more depth to your small spaces. It really works! Hang mirrors opposite your windows. Hang groups of mirrors as you would groups of pictures. You know you’ve done your job when you glance at the mirrors and wonder when your room grew. 2. 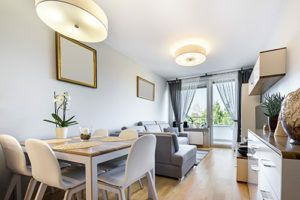 Even if you have a studio apartment (meaning just one room) or a home of few rooms, don’t be afraid to break up the spaces for how you want to live. You can designate your spaces by applying paint in these different areas of the room with different colors. Use screens, hanging fabric, even detached hanging windows to break up the space. It’s YOUR home, LIVE in it. 3. Downsizing usually comes with a notable limit to the storage space you may have appreciated by way of cabinets. Grow your space upward—hang everything you can in the kitchen. An alternate is to find trunks, tables, and other furniture that can pull double duty. A trunk can become a coffee table with seasonal items stored away that you only access a couple times a year. Put up plenty of shelving. Just be sure to arrange what goes on the shelves in a visually pleasing way so you don’t feel clutter overhead. Go ahead and display your collections. Have antique lunchboxes? Stack them on shelves. It will add color and fun to your space. 5. Most importantly, let your own personal style shine through regardless of how much space you have to work with. Let your space reflect who you are, and visitors won’t even notice the size. If you are considering downsizing and aren’t quite sure if you know of a real estate broker that can help you through the process, contact Nancy Miller of Coldwell Banker in La Grange, IL, and let Nancy do the footwork for you. Nancy can take you through Brookfield spaces to determine just how much “downsizing” is right for you.